Our customer in Lenox Twp Michigan chose this beautiful Harbour Blue Owens Corning Roof Shingles which was installed by Coverall Roofing in just one day! This home in New Haven, MI had a roof that had just about reached its expected life time. 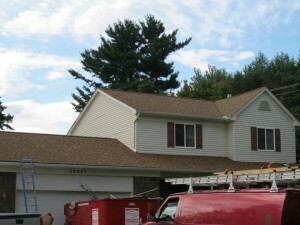 Our crew replaced the roof and the homeowners love the results! During our last wind storm, I can see at least 4 shingles that have blown off my roof. I would like an estimate for having the missing shingles replaced. Overhang on roof at front porch has wet rot. Damage may include structural column. Need repairs immediately. Roof repair. A couple areas of removed shingles after the March 8th storm. The high winds blew up some shingles on my roof that will need repair. With over 15 years of experience providing quality roofing services, Coverall Roofing are the local experts for roof repair and roof replacement in New Haven and nearby towns in Tri County Michigan Area. If you home has suffered storm damage, has an old or worn out roof, or has a roof leak, we can help. 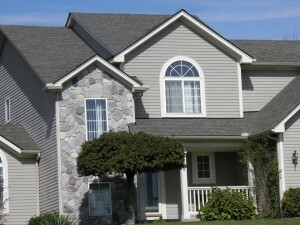 We install high quality asphalt shingle roofs that will provide long term protection and beauty for your home. Our roofing materials can be customized to match your needs, ensuring you get a quality solution. Call Coverall Roofing today to get quality roof repair or roof replacement for your home in New Haven. We offer FREE estimates on all our work!